The beautiful apartment extends to 85sqm and is divided into 2.5 rooms. The forward facing bedroom is accessible via the spacious living room. You also have access to one of the two balconies from here. Through the hallway you enter the modern bathroom. The second bedroom is at the end of the corridor and adjoins the kitchen. So it's a cozy walk-through room. The fully equipped kitchen leads to the second courtyard facing the balcony. The apartment is well insulated and thus ideally suited as a retreat despite its central location. This was a great apartment, on the first floor, light and airy, with two balconies. It was well equipped - everything you might need in the kitchen, lots of wardrobe space (and plenty of coat hangers! ), TVs in both bedrooms and sitting room. Dirk, our host was very helpful. He met us on arrival and showed us around, contacted us during the week to check if everything was ok and was there when we left and ordered us a taxi. The apartment is a 5-10 minute walk from the U Bahn and S Bahn so it was easy to get to all parts of Hamburg. Dirk advised us on where to purchase a weekly travel ticket. There is a large supermarket just over the road which is open late into the evening (but not open on Sundays) and restaurants nearby. We would recommend this apartment. We rented this two bedroom apartment for our time in Hamburg. Dirk and Lassee were wonderful hosts and very responsive. Upon our arrival Dirk met us in the apartment and showed us how everything worked. That was a very nice touch and one that we appreciated. The apartment had a great balcony which we used often and the kitchen was very nicely updated and had everything we needed. We slept comfortably in one of the two bedrooms. Although the neighborhood was busy with cars and pedestrians during the day (there was also some temporary construction noise during the day) it was very quiet and peaceful in the evening and over night, so sleeping was never a problem. It was a two block walk to the main train station and lots of stores and restaurants, which was very nice. There was also a grocery store a quick one block walk away. We were there in late July, during a very unusual heatwave, so a fan would have been very nice. I’m sure typically this wouldn’t been a problem and it did cool off in the evening so with a window open we had no trouble sleeping and were very comfortable. Thank you again Dirk and Lassee. You were perfect hosts! 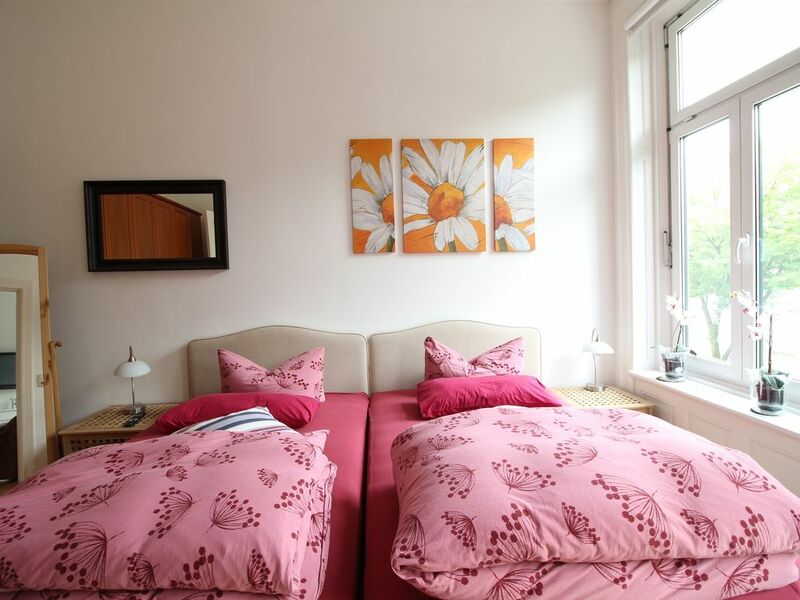 What a lovely apartment within easy 7-9 walking minutes distance to the Central Bus station and Hamburg Hauptbahnhof. Torsten was very responsive in communication about the apartment, and he was at the apartment to greet us, explained everything, and gave us tips for local shopping and dining. This quiet apartment is beautifully finished, new kitchen and bathroom, balconies in the front (smallish) and back(has two small tables and 4 chairs), and the beds are exceptionally comfortable (I want a mattress like that!). The S/U S bahn are within minutes walk from the front door., and the big REAL grocery store is just across the road. It was a perfect choice for visiting Hamburg. I would definitely go there again, and I highly recommend it. Torsten was very nice and accessible, especially as we had train problems reaching Hamburg due to a big storm and had to communicate with him many times about our changing arrival time. Note: there is no elevator, but that was no problem for us. Die Wohnung hat uns sehr gefallen. Wir haben gute Auskunfte über die Wohnung, das Gebiet und den Parken des Autos von Dirk gekriegt.